Classic roast leg of lamb recipe. Leg of lamb marinated in a citrus rosemary marinade, then oven seared and slow roasted. The most important thing to remember about cooking a lamb roast is to not over-cook it. Lamb has such wonderful flavor on its own, and is so naturally tender, that it is bound to turn out well, as long as it is still a little pink inside. We generally get great results with the searing method, starting at high heat and then dropping the temp which is the method described in the following recipe. If you use searing method, you will have ends that are more well done, and as you get closer to the interior, more rare. This way you have a variety to serve to guests. Another point where there are wildly varying opinions is the internal temperature that constitutes “medium rare”. I’ve seen references that range from 120° to 145°F. For this roast, I pulled it out at 125°F. As it rested the internal temperature continued to rise a few points as the meat continued to cook. We like our roast leg of lamb on the rare side of medium rare, and this roast was perfectly done to our taste. Clearly an accurate meat thermometer is essential, and it helps to insert the meat thermometer at different places into the deep interior of the roast to get a good read. 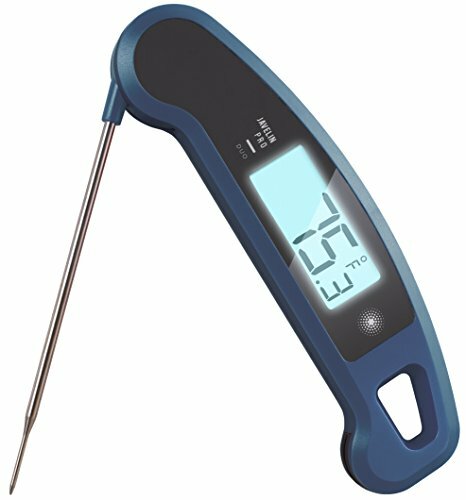 A great way to keep tabs on how well the roast is cooking is to use a remote thermometer. This way you can tell when the roast is done without having to open the oven door, avoiding the loss of heat that comes from doing that. The directions that follow in this leg of lamb recipe assume that you have let the roast sit at room temperature for an hour or two before roasting. If you are taking a roast and cooking it directly from the fridge, it will take longer to cook. Updated from the recipe archive, first posted 2006. The marinade we used on this roast comes from my friend Suzanne and it works quite well. A simpler marinade of rosemary, olive oil, garlic, pepper, and lemon juice would do the trick quite nicely too. One can also make tiny slices into the surface of the roast and insert slivers of garlic and herbs. 1 Marinate lamb: Place lamb and marinade into a plastic bag. Squeeze out as much of the air as possible from the bag and seal. Wrap again with another plastic bag to ensure that the marinating lamb doesn't leak. Marinate for several hours, or overnight, in the refrigerator. Remove the lamb, still in its marinade bag, from the refrigerator at least an hour (preferably two hours) before putting in the oven to help bring the lamb closer to room temperature before roasting. 2 Preheat oven and arrange racks: Preheat oven to 425°F. Arrange two racks in the oven - a middle rack to hold the lamb, and a lower rack to hold a roasting pan with which to catch the drippings. Note that this arrangement of racks and pans, with the roast sitting directly on the oven rack, will create a natural convection of heat in the oven, causing the roast to cook more quickly than if cooked the traditional method in a rack in a roasting pan. 3 Season lamb and place in oven: Remove the lamb roast from its marinade bag (you may want to temporarily place lamb in another roasting pan, just to make it less messy to work with.) Pat dry the marinade off the lamb with paper towels. Generously salt and pepper all sides of the roast. Arrange the roast fattiest side up, so while the lamb is cooking the fat will melt into the meat. Place the roast directly on middle rack of the oven, with a roasting pan on a separate rack a rung lower, to catch the drippings. You may also want to put some water in the bottom roasting pan, so that the drippings fall into the water instead of burning in the hot pan and smoking up your kitchen. 4 Roast: Roast at 425°F for 20 minutes. Then reduce the heat to 300°F and roast an additional 40 minutes (for a 6 pound boneless roast) to an hour (for a 6 pound bone-in roast). If you are cooking a roast bone-in, the bone will act as an insulator and will require a longer cooking time than a boneless roast. Note that the method of cooking directly on the oven rack will mimic a convection oven and the cooking time/oven temp needed will be less than you would need if you cooked the roast on a rack in a roasting pan. If you are cooking the roast directly in a roasting pan, rack or not, start the roast at 450°F and after 20 minutes reduce the heat to 325°F. Also, the shape of the roast will have an impact on the cooking time. Our roast was rather long and thin, so it cooked up fairly quickly. A thicker roast may take longer than expected. About 20 minutes before you expect the roast to be done, start checking the meat thermometer. Note that every time you open the oven door, you'll need 10 minutes or so to bring the oven back up to temperature, thus slowing down the cooking process. So, don't check too often, or use a remote meat thermometer. Remove the roast from the oven anywhere from 125°F to 135°F for medium rare. Lamb should never be cooked until well done or it will be too dry. 5 Let rest: Let stand for 25-30 minutes before carving (so the juices don't all run out when you cut into it). Cut away the kitchen string and slice with a sharp carving knife, 1/2 inch thick slices, against the grain of the meat. 6 Collect drippings for gravy or sauce: While the roast is resting, use a metal spatula to scrape up the drippings in the roasting pan. Use the drippings to make a gravy, or use just the drippings themselves to serve with the lamb. Serve with some mint chimichurri or homemade mint jelly. Hello! All photos and content are copyright protected. Please do not use our photos without prior written permission. If you wish to republish this recipe, please rewrite the recipe in your own unique words and link back to Roast Leg of Lamb on Simply Recipes. Thank you! It came out great! My leg was semi bone less, I made it on Dec 22 to celebrate my husband’s birthday. I added olive oil to the marinade and also rubbed it on the outside before roasting. I also inserted garlic slivers and rosemary sprigs all over the meat! It came out great… had a little trouble with the mint chimichurri, maybe I used too many herbs because I had to almost triple the olive oil so it would look like the one in the picture. Everyone loved it and I will sure make it again! Thanks Elise! Glad I saw this as I have a boneless leg of lamb in the freezer for Easter. what would be a good sauce for a BBQ lamb? Hi Mary, good questions! As for a side that works with both lamb and salmon, I would suggest roasted or grilled asparagus (you can grill while the lamb is resting). We do have an excellent grilled leg of lamb recipe on the site, I suggest checking that one out. As for sauce? I welcome suggestions from others. I’m rather old school with lamb and like mine with homemade mint jelly and meat drippings from carving. This past Easter, my wife suggested we try something different than what we’ve had every year. So, we got a whole leg of lamb, bone-in. I watched a video online for how to bone it out, and I did it perfectly on my first try. You have to make sure you get the musk glands out of it as you bone it. There are 2 of them, so make sure you get both of them. If not, you are in for some nasty leg of lamb. Anyway, I boned it out, cooked it in the oven with some Moroccan spices, and it turned out to be our new go to Easter meal from now on. The sweet spices are very aromatic, and the warm spices add a depth of flavor you should not miss. I did not marinate it in anything other than liberal amounts of EVOO, and salt, black pepper, rosemary, and thyme. I cooked it with cinnamon, turmeric, nutmeg, a small pinch of cloves, and some Sriracha sauce mixed together. The results were outstanding & our guests were asking for my recipe. Thanks for all the great recipes Elise. If I am going to cook two 6 pound boneless legs of lamb can I cook them into he same oven following this recipe? Hi Whitney, the cooking time will be longer. How much longer I don’t know. I’m cooking a bone-in leg of lamb (12.6 lbs) for my friends – any idea on how to cook this? everything I see is for boneless (not an option at this point). My friends and I have been reminiscing about leg of lamb that we used to have for Easter. My mom used to make it and unfortunately she has passed and I have no clue! Hi Stacey, cook it the same way you would cook a boneless leg of lamb, but note that it will take longer to cook through because the bone acts as an insulator. Estimate 12-13 minutes per pound total cooking time, and check at least a half hour before you expect it to be done. Elise – you have another lamb recipe http://www.simplyrecipes.com/recipes/grilled_butterflied_leg_of_lamb/ that is also perfection – one way we have done it for smaller portions is to grill half and freeze half with the marinade for later grilling – believe it or not the frozen with marinade version is even better than fresh (or at least as good) – you’ve got lamb down girl! 1. Mix jellies about a ½ cup currant to ¼ cup mint. Amount need not be exact but keep 2 to 1 ratio of currant to mint. 3. Add a little lemon juice to cut sweetness. Note: We usually make this in a mini Cuisinart but it can be done in a bowl. Keeps forever in refrigerator. This was my mother’s recipe. Elise, your recipes and pictures are amazing. Thank you for your great work! I’ve never made lamb before and this has inspired me to try it out. I really like the idea of searing the lamb first. I have never heard of that. When I cook ribs I will usually cook them low and slow then sometimes I will turn on the broiler to crisp them up a little at the end. Have you ever tried this with lamb? Thanks Arthur! Many people have success with the low and slow and sear at the end method with different types of roasts. I haven’t tried it with the lamb, but I’m guessing it would work just fine. I just finished cooking my lamb. My son is making a Greek yogurt sauce for our Gyros. It’s gonna taste great! Thanks for the recipe. A few of the cheaper wines sell “individual” bottles, usually can find them at the supermarket, for a buck or two. Really a great way to buy wine for cooking. Also, there’s alway TwoBuckChuck from TJ’s, which is my go-to for cooking wines, plus the missus keeps it on hand. To Elise: why not just use a remote probe thermometer, instead of opening the door to check temps? I’m a big smoker (BBQ, that is), and opening the door/cover is a big no-no. Besides the time it takes for temps to recover, it also throws any humidity/moisture right out of the pit/oven. And I totally agree with pulling lamb at 130°, resting it to 135. But on a big hunk of meat, one needs to pull it out of the fridge at least an hour before cooking. Cooking time given in recipe is far off! Needs at least another 20-30 min. cook time. I made curry with leftovers. chicken broth, greek yogurt, raisins, coconut milk, onions, peppers, curry powder etc. You need to double that cooking time even for medium-rare.. Roast for 20 min at 450 and then lower to 325 for an additional 20-25 minutes per pound on a boneless.. and 30-35 minutes for bone in..
Don’t have too much cooking experience as the “man of the house” but willing to try something new. Picked up the leg of lamb at the store, follwed the directions (about 95%) – it came out perfect and we had a great dinner! THANKS! This marinade is phenomenal! I used the recipe exactly as called for, for, except I added 1 extra tablespoon of fresh Rosemary and Thyme. I cooked an 8 lb bone-in leg of lamb JUST as directed. It was my first time to cook lamb, and it was a crowd pleaser served medium rare. Absolutely wonderful and so easy. I marinated the meat overnight to provide the best flavor! I never buy wine and though I’m not opposed to using it for cooking I have a hard time bringing myself to buy a whole bottle when I’ll only be using a cup. In order to make this recipe do I need to use wine or is there something else I could use instead? Fourty-four years old and I’d never before eaten lamb. My roommate enjoys lamb chops, so when I came across this recipe I asked her if we (the Royal We, as I’m the cook around here) should try it. This recipe is very thorough. It addresses everything. If you follow the recipe, you can not go wrong – and it produces an amazing dish. My thanks to Elise and Simply Recipes .com. I’m so glad you liked it Brett!